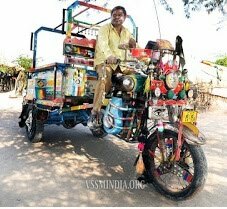 Ravjibhai Kangasiya drives Auto Rickshaw at Rajkot and his wife used to go to sell cutlery items keeping it in a Tokri. 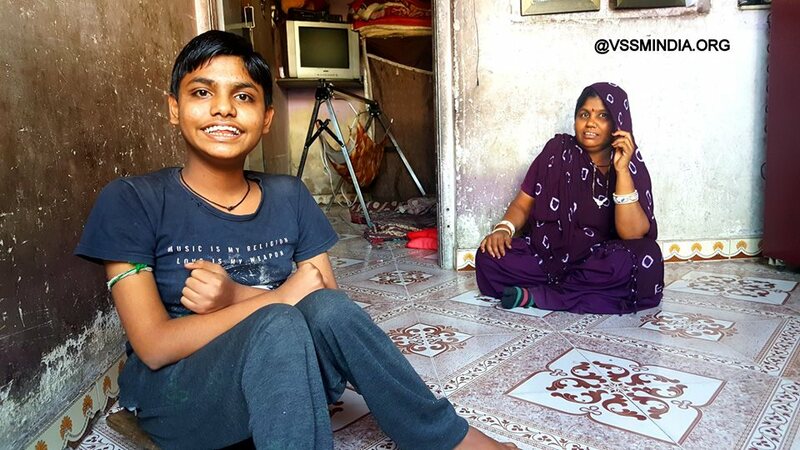 His son Gopal was healthy initially so he used to run here and there but once he fell ill and he lost the capacity to move by legs. They spent a lot of money for his treatment but it went in vein. The medical expenses were so high that it was difficult to manage the expenses of basic needs. 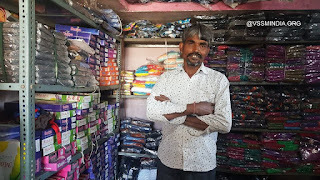 Maulik inspired them to organise a union for Kangasiya community, that they all get united and the material he purchases on a wholesale rate, should be given the community members to sell. 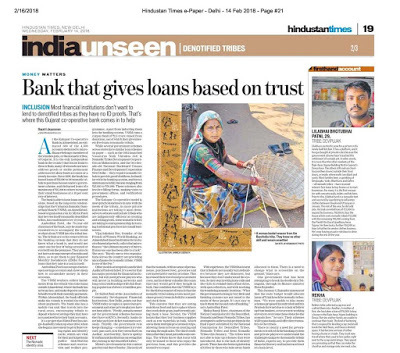 Field worker Kanubhai and Chhayaben’s guidance also helped. VSSM gave an interest free loan of Rs. 1, 00,000/-. Now from which trader he used to purchase his business material, he paid there Rs. 1, 00,000/- cash for the material. Also convinced the trader to give more credit of Rs. 1, 50,000/- for more material. The trader was not ready initially but VSSM’s prestige convinced him and he agreed to give more material on the credit of Rs. 1, 50,000/-. Everything was well arranged. Ravjibhai Kangsiya's son Gopal and his wife. Ravjibhai was worried that if people of his community would not purchase the material from him then what would he do? 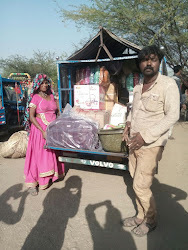 Kanubhai, VSSM field worker constantly convinced other members of the Kangasiya community to purchase material from Ravjibhai. 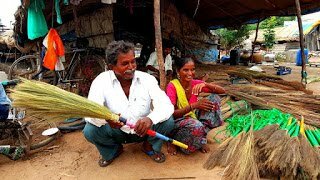 His community members started purchasing material from him and life changed! “Ben, can any Kangasiya’s shop be like this? But all these are your efforts that it has become possible,” he said and took us to see his shop. The women who were purchasing the material from other traders were now getting the same material at a cheaper rate from Ravjibhai’s shop. VSSM could successfully saved the community from the negative politics within the community and other surroundings. The attitude of ‘Share happiness and Be happy’ is succeeding. 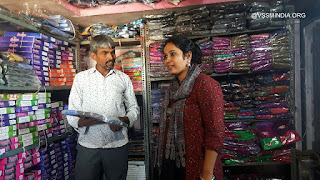 Ravjibhai showed his shop and I met dear Gopal too! 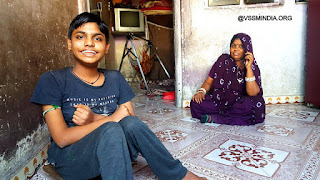 Gopal regularly listens the posts that I put on Facebook, from his father Ravjibhai! રવજીભાઈ કાંગસિયા રાજકોટમાં રિક્ષા ચલાવે ને પત્ની ટોપલાંમાં શૃંગાર પ્રસાધનો વેચવા જાય. દીકરા ગોપાલના પગ પહેલાં સારા એટલે એ દોડતો ફરે પણ પછી એવી બીમારી લાગુ પડી કે, એનું ચાલવાનું જ બંધ થઈ ગયું. દવા પાછળ ખર્ચોય ઘણો એટલે ઘર ચલાવવુંયે અઘરુ પડે. કાંગસિયા સમાજ એક થાય અને પોતે જ હોલસેલમાં સામાન ખરીદેને પછી સમાજના અન્યોને વેચવા આપે તેવું આયોજન કરવા મૌલિકે કાંગસિયાઓને પ્રેર્યા. કાર્યકર કનુભાઈ ને છાયાબહેનનું માર્ગદર્શન ભળ્યું. એક લાખની વગર વ્યાજની લોન અમે આપી. જે વેપારી પાસેથી અત્યાર સુધી બે પાંચ હજારનો સામાન લાવતા તેમના ત્યાંથી એક લાખ રોકડા ને દોઢ લાખનો ઉધારમાં સામાન આપવા વેપારીને સમજાવ્યો. વેપારી પહેલાં તો તૈયાર નહીં પણ સંસ્થાની શાખથી બધુ ગોઠવાયું. રવજીભાઈને ચિંતા હતી પોતાના સમાજના લોકો એમની પાસેથી સામાન નહીં લે એની. પણ કનુભાઈની સતત સમજાવટથી રાજકોટ ને તેની આસપાસમાં રહેતા કાંગસિયાએ રવજીભાઈ પાસેથી સામાન લેવાનું શરૃ કર્યું. ને જીવન બદલાઈ ગયું. 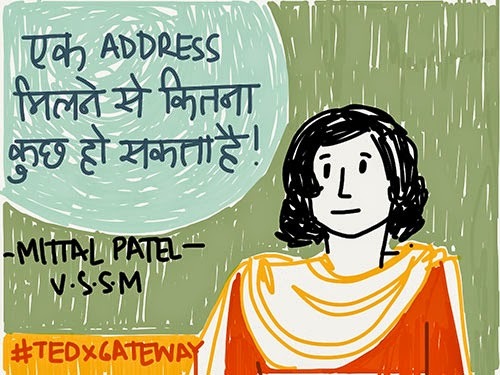 ‘કાંગસિયાની આવી દુકાન હોય બેન? પણ જુઓ હારા પરતાપ તમારા તે આ બધુ થ્યું...’ એમ કહીને રવજીભાઈએ દુકાન બતાવી. જે કાંગસિયા બહેનો રવજીભાઈ પાસેથી સામાન લેતી થઈ એને પહેલાંના વેપારી કરતાં સસ્તા ભાવથી સામાન મળવા માંડ્યો. ટાંટિયાખેંચમાંથી સમાજને બહાર કાઢવામાં અમે સફળ રહ્યા..
રવજીભાઈએ દુકાન બતાવી ને ખુબ વહાલા ગોપાલને પણ મળવાનું થયું જેનિયમિત પણે મે મુકેલી ફેસબુક પોસ્ટ રવજીભાઈ પાસેથી સાંભળે છે..